Cement executive David Collins was cruising along the Blue Ridge Parkway some 25 years ago in search of a campground when he stumbled across Mount Mitchell Golf Club by accident. He immediately noticed the pristine crossed mowed fairways and striking beauty of the valley layout flanked by the Black Mountain Range. Collins vowed to find out more about the place outside of Burnsville. He did more than that. Collins has been entertaining his clients and select employees from Holcim (US) Inc. here ever since. Members of his group came here again in June 2014 from as far away as Colorado, Texas and Utah, some driving two hours from the Charlotte airport to join in the casual fellowship. The cement executives are just one of many repeat customers who find the relaxed atmosphere, breathtaking beauty and fine food at the North Carolina mountain golf resort intoxicating. Collins has seen the familiar faces of McKinney, owner and co-founder Jim Floyd and course superintendent Jim Laughridge for the last quarter century. In fact, the trio has combined for 109 years at Mount Mitchell Golf Club – Floyd and Laughridge on site from the opening in 1975 and McKinney, who used to play his prep golf matches here, joining the team in 1983. Such stats are not kept, but the three have to be the longest standing trio at any one course in North Carolina. A big picture window in Floyd’s office provides him with a panoramic view of portions of the bent grass fairways and the towering mountain range off in the distance. It is the same view, just 12 feet higher, that golfers see when teeing off No. 1. “I sometimes take it for granted, but it’s always there and I am grateful for that,” Floyd said of the view as the course gets ready to celebrate its 40th anniversary next June. “I would not want to be anywhere else. I just love it,” added McKinney. If you’re looking to get away from it all, Mount Mitchell Golf Club in a piece of Yancey County paradise is the place. Head west on Interstate 40 through Marion and then onto N.C. Highway 80, where you’ll encounter dozens of hairpin turns on the way up the mountain to the Eastern Continental Divide and Blue Ridge Parkway Mile Post 344. Continue down the mountain 2 more miles and the golf course is on the left. Floyd and his father Verne, a real estate broker, began the concept of the course and surrounding real estate development in the early 1970s, the old man convincing golf course architect Fred Hawtree, whom he had met in England, to design the course. It is Hawtree’s only design in the United States and consistently is regarded as one of North Carolina’s top public golf layouts. The back tees measures just 6,495 yards – short by today’s standards – but accuracy is a must as the South Toe River forks its way in, around and through the course. Mount Mitchell Golf Club usually opens in mid-April and shuts down for the season in early November, logging a respectable 21,000 rounds a year over a 6½ month period. The front nine is virtually flat, with the only major elevation changes occurring on the approach shot to No. 10 green, on the short downhill 145-yard 11th hole and then heading to the clubhouse with a 100-foot drop from tee to fairway on the finishing hole. Golf is just half the fun here, though. Make sure you stop by the snack shop prior to teeing it up and pick up a bag or two of “fish pellets” at 80 cents each. The river is stocked with trout each season and they have sort of become the local pets of golfers. “It is like a shark feeding frenzy when you throw that fish food in there,” McKinney said. “They like Lance crackers, too,” joked Floyd. “They will eat about anything. They just come right up to the bank now when you’re there, looking for their food. You don’t think about fish being like that. 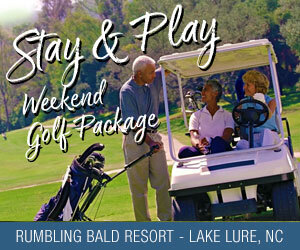 Mount Mitchell offers a variety of stay-and-play packages that include as few as one night of lodging in one of 25 homes for rent or at the resort’s fairway townhomes and condos. Summer temperatures are usually in the low-to-mid 80s, with mornings dipping into the high 50s. “That’s a great way to start your golf day,” Floyd said of the cool temps at sunrise. Chef Teo Glaus from Switzerland has quite a following in the clubhouse restaurant. Of course he serves mountain trout, but the colossal ribeye steak is seasoned to perfection and is a “can’t miss” selection for meat lovers. The dining views are as captivating as those on the course, the sun setting over the mountain range as you eat. Few golfing venues in North Carolina are as uniquely quaint and consumer friendly, all while offering an artful canvas with each golfing shot.